Shown above are two views, front and rear, of an English red lacquer clock case, after restoration. (In these photos, the case does not yet have the ormolu handle, finials, and other ornaments installed). Upon initial examination, there were some typical losses of the lacquer decoration overall, but clearly the most severe damage had occurred on the top areas, as shown in the detail photo below. My goal was to consolidate the remaining decoration, and then try to recreate the lost portions of the images around these fragments. In these situations, I find it helpful to look at as many other contemporary sources as I can find, e.g. 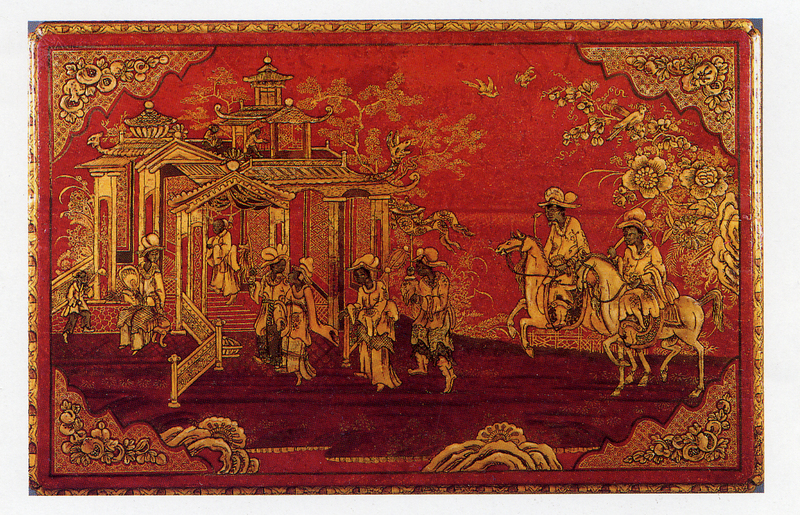 lacquer clocks and other furniture, as a guide to imagine what the original images might have looked like. For example, the photo shown below is of a table top attributed to Giles Grendey (1693–1780) that was probably produced not long before our clock case. Though the art work on our clock case is more naïve, these types of references can still be quite useful. With the aid of many similar examples, and by carefully studying the existing fragments of decoration, I attempted to piece together the images as shown below.